Charles H. Nogle, 88, passed away peacefully in his home in Champaign on March 16. Charlie was born on February 5, 1931 in Champaign, the son of J. Harold and Audra Bailey Nogle. He had one sister, Marianne (Wilson). Charlie was an Eagle Scout and a lifelong supporter of Camp Drake. In 2008, in honor of his father Harold Nogle, he commissioned the design and construction of the Camp Drake Shooting Sports Range. Charlie graduated from Champaign High School and is a noteworthy member of the class of 1949 known as the “The 49ers”. This class has been recognized for their local and national achievements and positive impact on the community. While in high school Charlie learned to fly at the Champaign Airport using his uncle Claude Nogle's airplane, beginning his lifelong love of aviation. Charlie attended Miami University in Ohio where he was a member of ROTC and a member of Phi Delta Theta fraternity. He transferred to the University of Illinois for his Senior year graduating with a degree in business in 1953. Charlie started his business career with Illinois Bell in Aurora, IL. In 1954 he returned home to transition his family’s heating and coal supply business into the modern natural gas HVAC industry. Charlie used that platform to expand into commercial real estate development, building apartment and restaurant investment properties. He partnered with Monical Pizza Corporation as an investor and developer, building restaurants around Central Illinois. Charlie was a key player in keeping Monical’s Pizza locally owned. For over 35 years he has been a director of Monical’s. Charlie's passion was aviation. He owned and flew over 30 different makes and models of aircraft. He achieved Commercial Pilot with single and multi-engine and instrument ratings. In the middle1950s he started acquiring parts to rebuild his dream aircraft, a T-34 Mentor which was used by both the Air Force and Navy for training. His first project led to dozens more and over the years he became recognized as the worldwide authority on the T-34 Mentor. He founded the T-34 Association and became known by that community as "Mr. Mentor”. 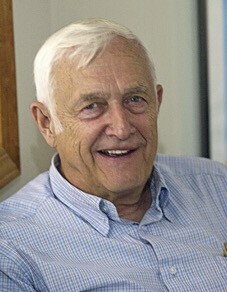 Charlie was a long time EAA Warbirds of America director, and is an honored member of both the Illinois Aviation Hall of Fame and the EAA Warbirds of America Hall of Fame. He passed his love of flying on to many in his family with Jim, Jud, Ellen, and grandson, LCMDR Joel Nogle, all being pilots. Charlie was an avid WWII historian especially as it related to military aviation, amassing an extensive WWII book collection. He was also a dedicated supporter of the Ernie Pyle Museum in Dana, IN. A fan of all wildlife and his family’s many canine companions, Charlie has been an active supporter of various local and national animal protection charities. Charlie is survived by his wife of 30 years, Diana; his sister Marianne Wilson; his children: James Nogle (Gayle), Charles J. Nogle “Jud” (Ann), John Nogle (Diane), and Ellen Nogle Proffit (Matthew); grandchildren: Joel, Jeff, Olivia, and Ainsley; great-grandchildren: Liam and Emma; step-children: Stephanie and Joshua; step grandchildren: Chelsea, Sheldon, Brennan, Arianna, Arwen, and Janie; step-great granddaugher Sophia. The family would like to thank Christine Campion for her loving care. A private family graveside service will be conducted at Woodlawn on March 30th and a Celebration of Life will be held at some time in the future at the Nogle Aircraft Hangar at Willard Airport. In lieu of expressions of sympathy, the family requests that donations be made in Charlie’s name to the Champaign County Humane Society.